"All children struggle with "Who am I?" as well as "Who are we--as a family?” The story of the life of an adopted child "needs to go deeper" than statements of fact. The adopted child needs to experience her story from many perspectives and with both the mind and the heart. He needs to know that the mystery of his spirit is fully welcomed by his adoptive parents. She needs to know that her unique story has its place among the community of stories that have emerged over the generations, among the cultures and nations of the world. By bringing stories into the home and by creating their own stories--together--parent and child are jointly creating interwoven stories of their family history. Once Upon a Time is a magical phrase that conjures up a faraway world from long, long ago. For our internationally adopted children, it is also a phrase that bridges the huge chasm between their early lives and who they are now. When life feels like a fairytale of good and evil, love and loss, reality and fantasy, it sometimes takes a story to create sense and meaning. 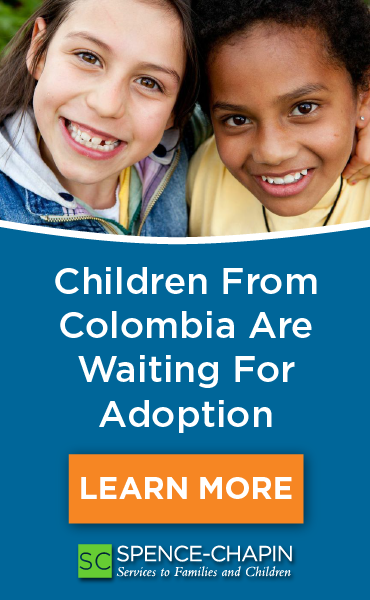 How will your child see her or his adoption? What “story” will they read into their own lives as they gain awareness of what happened to them as young children? Parenting narratives (stories with purpose) help the child to see a complex tale from different perspectives, and can give a child the opportunity to examine serious thoughts and emotions in a familiar format. They also allow the parent to present the truth in several age-appropriate ways and provide point-of-views that are personally empowering to the adoptee. Realizing that there are gentle and creative ways to approach the issues of adoption and the intense feelings of adoptees, and that children’s books and story-telling can help provide the tools, is a relief for all of us adoptive parents who have taken on this monumental job without much tech support. Adoption issues are normal. Some require a therapist’s attention, but the issues that most often get expressed by adoptees are usually addressed at home by mom or dad. We want our children to express all of their feelings surrounding adoption because it allows us to do our job: we are the responsible parent and we need to encourage, support, listen to, and walk with our adopted children through their personal stories and beliefs. Building Identity -- children need a foundation for “self”; they need the truth AND they need to feel empowered by their story. Kids can’t go forward without a past! Our internationally adopted children come to us missing the first steps of the Dance of Attunement. Attunement happens between a newborn and a mom as they learn to pick up and respond to each other’s verbal and non-verbal cues. Voice, eye contact, facial expression and touch, all play into this amazingly essential give-and-take; a baby learns she has control over this all-important mom (equating to control over her own world), and she learns she can trust mom to understand and respond to her needs. How do we foster this dance, this connection, in our toddlers and older children? Most of us are not experienced attachment therapists or adoption social workers, yet we parents can do what moms and dads have always intuitively done to connect: we can create shared emotional experiences with our children. We can involve our children’s “perceptions, thoughts, intentions, memories, ideas, beliefs and attitudes” (Dan Siegel, MD). We can use our facial expressions, voice, and body movement to MATCH and/or RE-DIRECT our children’s affect and response. We can verbally help our children understand what they are feeling by communicating our own feelings. Stories are universal and personal. They can be utilized as shared emotional experiences, and we can use dramatic voices and active body language to help our children become involved. We can share our own emotions, and help a child reflect back on their own. When we are aware of our children’s body signals and emotional cues, we can tailor our storytelling to feed our children’s needs. We can connect on the cognitive level, and from our hearts. Adopted children may need to re-learn to love, trust and feel safe. They may need to learn about families and relationships—children who have lived some or most of their young lives in an institution cannot be expected to understand the unseen structure of a family, or the role of a mom or dad. Stories and books don’t make attachment happen, and they don’t heal a traumatized child or cure attachment disorder. But used with a parent’s awareness of attunement, they can provide a “warm fuzzy” on the long chain of warm fuzzes that are necessary to build a loving relationship. Storybooks can assist children who are navigating a new environment. They can be used to begin a conversation or open a topic, and can be personalized to a child’s circumstances. Books are user-friendly and non-threatening, and can help a parent find the words that unlock shared feelings. I didn't change the sad stuff the poor dog had to experience, but there is always more than one take we can make on every finish. "Changing the ending" of a sad story doesn't mean I stealthily add an ending that is happier... it means that I can help my child change HER PERSPECTIVE of the ending. The truth never changes, but our understanding of it can. "Changing the ending" are words for a powerful tool: our parent voices giving our children alternate perspectives, choices, and control over circumstances they may encounter in their own lives. It doesn't mean censorship even in the ‘protective’ sense-- it means empowerment. Words ARE powerful and although they can be hurtful, they can also help heal and strengthen. My daughter and I ended up in a hug after sharing our sadness (and relief over Lassie making it home! ), sitting close together, both of us enjoying the moment and each other. Books that might appear “too young” for a child’s chronological age, may be very appropriate for that child’s emotional age. Do not hesitate to use younger-level picture books that have stories that touch all ages on a deeper level. The books do NOT have to be about adoption to be useful. Reading a book with your child in your lap is cozy and comforting. Alternate with having your child sit directly in front of you, knee-to-knee, while holding the book up and open. Use a lot of expression! Be passionate! Use gestures! Some children have difficulty in “getting” non-verbal cues, and are helped with story interpretation through exaggerated, dramatic interaction. Change the tone and volume of your voice (whisper to get a child’s attention). Stories with repetition and catchy say-aloud lines are fun to read together. Be aware of your child’s physical and verbal cues. If a story makes him or her uncomfortable, stop and talk about it. Trust and emotional safety are key to attachment, and it is up to the parent to listen to the child, acknowledge the child’s discomfort, and take the lead in either continuing the story, deciding to offer another story, or by suggesting a different joint activity. Story-time can be an example of “reciprocal communication of thoughts and feelings, and shared activities” (Dan Hughes, Ph.D). Dr. Hughes’ P.L.A.C.E philosophy --Playful, Loving, Accepting, Curious, and Empathic interactions--reinforces attunement, and according to Dr. Hughes, facilitates the capacity for fun and love. Ask your child specific questions about what they think and feel about the story. Share your own opinion/feelings. “Spin” the story and explore alternate endings. Have fun together! There is no perfect, pre-determined set of children’s books that work for every child. Therapists that work with narratives believe that the parent understands the child better than anyone else, and will have a better feeling for stories that will touch the child on some emotional level. Narratives are a PROCESS; There is no “right” way to tell a story; if you screw up, there’s always another chance to re-tell it! "Disney movies can be a wonderful starting point for discussing bigger life issues. When my daughter has expressed fear of the necessary mean character, be it witch, queen, or stepmother, I explain that without evil there can be no happy ending. Without a nasty character how would we measure the character of the good one? In life good things happen and bad things, there are good people and bad. There can't be one without the other. I try to boil the story down to the bone. There is challenge and evil, but courage and pureness of heart triumph and everyone lives happily ever after. Sometime on a daily basis." A Disney movie, like a dark fairy-tale, is an opportunity for talk, and for a release of emotion. It is an opportunity for a parent to attune with a child and help them emotionally “re-write” the ending. We can use Disney to declare what we, as parents, would do to help our children no matter what happened. AND what our brave, creative, strong children could do to help themselves! CLAIMING NARRATIVES take parent-child stories a step closer and deeper, and offer a warm and caring “re-write” to a missing early chapter of the relationship. Typically, a claiming narrative is told in first person using storytelling’s oral tradition, and is used to build or repair an emotional bond. and what you look like. that play on the grass. Helping a child develop an identity that includes the past, the present and the future is integral for a child to feel whole. For adopted children five to ten years old, identity may be the consuming core issue. Their realization of the blank space in their early family history coincides with the hollow feeling they carry inside, with a profoundly sad result. They don’t know who they are. How do we help our adopted children develop a sense of identity? Particularly, how do we help international adoptees feel pride about where they were born, AND help them be comfortable in the world they live in? “I still wonder about my life in China. parents that weren’t mine to keep. it helps me bring both my sides together. As parents, we also tell stories to change a child’s view of themselves. For instance, the protagonist in At Home in This World has had sad things happen to her, but she is not a victim. She is coming to terms with her story and it’s enigma, and she is empowered by her (and her parent’s) particular view of her life. The Family would categorize At Home in This World as a “Successful Child Narrative”. The Dulwich Centre, specializing in Narrative Therapy, would call it an “Alternative Story”. “There are many different sorts of stories by which we live our lives and relationships – including stories about the past, present and future. Stories can also belong to individuals and/or communities. There can be family stories and relationship stories. How do we negotiate and interpret these important stories about identity in a way that allows our children to really integrate what we are saying about them? A narrative can help to change a child’s reality (or “internal working model”, as trauma-specialist Dr. Bruce Perry calls it). Dr. Dan Siegel has been researching the kind of narratives that have the power to effect positive change in our adopted children. What he has found is that certain interactions can model and facilitate brain-integration of the thinking and feeling—the key is in using verbal and non-verbal signals at the same time to help integration of the story take place (language plus emotion, for example). Both Dr. Siegel and Dr. Hughes have researched and clinically validated the importance of marrying thought and feeling when working on attunement/collaboration and attachment. It is impossible to really help a child deal with their adoption stories or adoption issues, without having or fostering parent-child attunement. It is the BASIS for telling stories, and on a much deeper level, for building a child’s identity. Healthy growth isn’t possible without a firm foundation. Attunement with our children helps them to create their own positive self-image. Therapist Denise Lacher said, “If you change the story, you can change self-understanding.” I just call it “spin”, but they both work the same way. When you talk with your son or daughter about their birth story and abandonment, you have the power in your words to make your children feel like Heroes or like Victims. We are all multi-storied people, and we have choices we can make about our life-narratives. By helping our children to see the spaces in their story and in the world around them, we can give them a tool that is truthful and life-changing. Words have the power to change; it is a force majeure to hand that power to our children, so they know that the rest of their story, their ending, is within their control. A pre-adoption life story, or Lifebook, can help define a narrative space, and an adopted child can better learn to acknowledge the empty places in her history when they are re-framed and normalized by the principal adult in her life. It's all about empowerment; a co-created Lifebook (shared words and emotion!) gives a child ownership of her life story, and all of her thoughts and feelings. A 'Baby' Lifebook is easily created by putting chronological photos in a sturdy mini album. Begin in your child’s birth country, with the earliest referral photos you have of your child. Include photos of the birth family, foster family or orphanage caretakers, if you are lucky enough to have them. Add photos of your child’s city or province, the local people and rural countryside (use the internet to obtain pictures if you or your friends were unable to take them yourselves). Periodically flip through the album with your young child, and matter-of-factly discuss each photo. No writing required! This automatically, naturally and regularly makes parents use words like adoption, birthmother, orphanage, abandonment, finding place, Baby House, and foster parents. The photos also give parents a chance to talk about how the child must have felt at the time of each photo, judging by the facial expressions and body language in the pictures. Talking about the ‘emotion’ in the photos help children to think a little more deeply about what they are looking at, and helps parents get comfortable with adoption conversation. Use copies of the original photos for a Baby Lifebook, so that a child can keep the album on his own shelf. You can end the album at a first birthday at home, or first adoption anniversary, but it doesn't really matter; the focus just needs to be on the child’s life, pre-adoption, and on his transition to his new family and home. ADOPTION VIDEOS and PHOTOGRAPHS can be used as a jump-off point to conversations about a child’s early life, and can give clues to a child’s pre-adoption history. Looking at these tools analytically, a parent and child can discern the emotions of all involved and sometimes deduce relationships, level of pre-adoptive care, and a physical and developmental history. In looking at your child's adoption day video or photos and the first months or year at home, it's important to talk about the emotions that the baby in the images might have been feeling, and the emotions your child has today watching herself on tape. It's okay to talk about the fact that she might have been scared, or grieving a caregiver or foster family during the adoption, and you might point out how your own happy expression does/doesn't match hers in the video. Ask her if she can see the difference, and can she guess why? "Where did I come from? What did my birthparents look like... what will I look like? What was my life like before I met you? Why was I abandoned?" are questions my daughter has asked me, and she and I have looked for clues together. We might never find definitive answers, but we piece together what we can and find comfort in the process. How can adoptive parents make sense out of the sometimes trivial, sometimes confusing, sometimes overwhelming information we have for our children? What was the caregiver's personality? Name? How did he play? What amused him? Did he look sad, happy or scared when he met you, and did his expression change over the next two weeks together, and next couple of months at home? What do you think she was thinking/feeling? If you visited the orphanage, where did he spend his time? What was the atmosphere? Who were his friends/crib-mate? What were How did your child interact with her/his caregiver? What were her milestones, once home? First tooth, first word, first step? Photos and video helped to familiarize my daughter with her beginnings, and the visuals helped me to talk with her about the bittersweet side of adoption. Our video is part of my daughter's life story; it is part of my ‘mothering’ story. It is a precious piece, because it captures loss and love, and the first tentative moments of family connection. 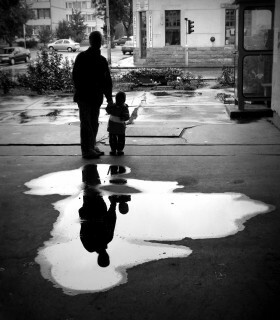 Pictures do tell a story… but it’s equally important to communicate how you and your child feel about what is gleaned from these visual puzzle pieces. An empathic, attuned parent-child relationship will remember the “dance” steps through the questions of childhood, the angst of pre-adolescence, and the teen identity crisis. Ultimately, we want our children to be comfortable with all of their pieces and with who they are, and giving a child ownership over their history is part of a Parenting Narrative. The A, B, C’s of adoption stories provide us with some of the fundamental tools of family. We can’t be untruthful about a child’s life story… but we can help our children connect a narrative that hangs together from the fragments that are known, and re-story the whole with our love and strength.